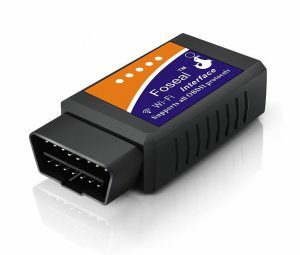 When it comes to OBD2 adapters for iOS devices, many Bluetooth adapters especially cheap ones are not compatible. Most of them use WiFi to connect to iOS devices instead of Bluetooth. However, some high-end adapters use a Bluetooth connection, and they are compatible with both Android and iOS devices. Here are the best OBD2 adapters for iOS in 2017. Foseal adapter uses WiFi to connect to your smartphone or laptop. It’s compatible with Android, iOS, and Windows, but not recommended for Android users. The adapter is basic. It doesn’t have any fancy or exclusive features. And it’s relatively a large size. Depending on the location of OBD2 port, you may have a problem with kicking it or falling itself while in use. On Amazon, you may find several adapters which are similar or identical to Foseal. They are actually all the same. I chose Foseal and listed here in the post because of many positive reviews and feedback. Foseal provides a 1-year guarantee and good customer support. 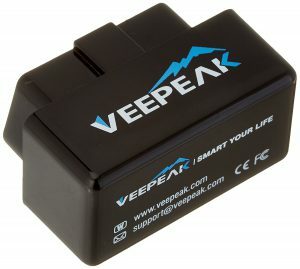 Veepeak is another basic OBD2 adapter using a WiFi connection. It’s compatible with Android, iOS, and Windows, but not recommended for Android users. It has a remarkably small design. It’s only 1.3-inch long. Wherever OBD port is, it won’t stick out and interfere your driving. Just like Foreal, you may find some adapters which look similar or identical to Veepeak, and they are all the same. I chose Veepeak and listed here in the post because Veepeak has been around in the last several years. And they have many positive reviews and feedback. Veepeak comes with 30-day money back guarantee, 12-month hassle-free replacement warranty and easy to reach, friendly customer support. 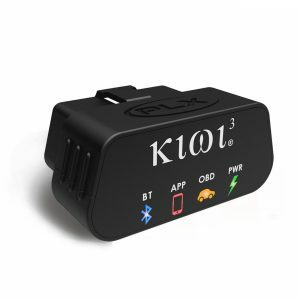 Kiwi 3 is the third generation of an OBD2 adapter from PLX Devices. Kiwi 3 is one of a few Bluetooth adapters which are compatible with both Android and iOS. And it’s compatible with Windows, too. Unlike previous versions, Kiwi 3 no longer has a cable, and it became one of the smallest OBD2 adapters on the market. It’s only 1.3-inch long. PLX Devices claims that it’s up to 4 times faster than competitors. “Fast” means that it’s capable of providing more data points and quicker responses. For example, when you see live data, graphs are smooth, and gauges’ movements are more realistic. The adapter consumes only 1.24 watts when active, 0.1 watts when asleep. You can leave the adapter plugged into OBD port all the time without worrying about a battery drain. PLX Devices created the original mobile app called Kiwi OBD. It’s available at Apple App Store and coming soon to Google Play Store. The app looks cool and has useful features, but it’s ridiculously expensive. You can use it for free as a trial, but it lasts merely one hour. Before Kiwi 3’s release, I assumed the app would come with the adapter for free. However, it turned out that it wouldn’t. Besides, it’s costly. It’s a big disappointment. Apart from the app, the adapter is reliable, fast, and versatile to compatible with many third-party apps. 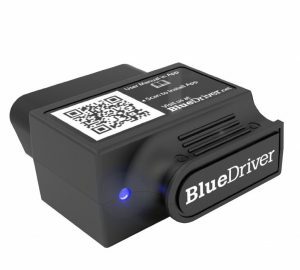 BlueDriver is a Bluetooth OBD2 adapter which is compatible with both Android and iOS devices. The adapter exclusively works with their app called BlueDriver app. The app is available at Apple App Store and Google Play Store, and it’s not for Windows. BlueDriver is focused on vehicle’s diagnosis. Through the app, you can access to Repair Reports drawn from a database of over 6.6 million fixes verified by certified auto mechanics. You may search on the internet and get the same information, but you may end up reading unrelated articles or guess works from armatures. The reports save you time. And, you can perform enhanced diagnosis such as ABS, SRS, and transmission if your car is supported, At the time of writing, supported vehicles are GM, Ford, Chrysler, Toyota, Nissan, Honda, BMW, and VW with some models exceptions. The company is always working on improvements. In fact, when BlueDriver was just released, the enhanced diagnosis was available on only GM, Ford, and Chrysler. In the last several years, many other makes and models have become supported. It’s worth noting that all these features are available without any additional costs. Pay for the adapter, and you can use them without any restrictions, including new ones that will become available in the future. Dimension 2" x 1" x 3.5" 1.9" x 1" x 1.3" 2" x 0.7" x 1.3" 1.9" x 1" x 2.2"